My Dad flew 50 missions over enemy territory during World War II. 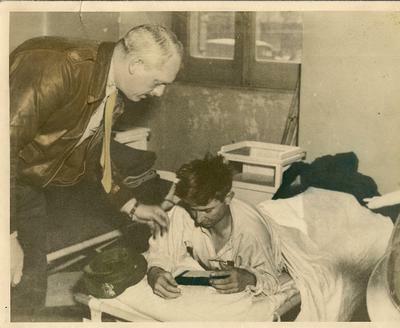 While flying over Pulaski, Rumania on April 4, 1944, he was wounded with shrapnel in his legs by anti-aircraft gun flying on a volunteer mission. They had asked Curt Torfin to go and he said "no way." Curt told my Mom that they asked him to volunteer and he said no. He then pointed at my Dad and said "That nut volunteered and that night I went to the hospital to see him all shot up." He was carried to Naples, Italy to the hospital for a few days. While there Colonel Graff presented my Dad the Purple Heart.